Larry J. Sabato's Crystal Ball » WHERE ARE THE OBAMA SCANDALS? WHERE ARE THE OBAMA SCANDALS? One of the least remarked upon aspects of the Obama presidency has been the lack of scandals. Since Watergate, presidential and executive branch scandal has been an inescapable feature of the American presidency, but the current administration has not yet suffered a major scandal, which I define as a widespread elite perception of wrongdoing. What happened, and what are the odds that the administration’s streak will continue? Obama should be highly vulnerable to scandal given his standing with Republicans. My research identifies presidential approval among opposition party identifiers as a key risk factor. The reason is that discontent among the opposition’s base creates demand for negative news about the president, encouraging opposition legislators and members of the news media to promote allegations of misconduct. 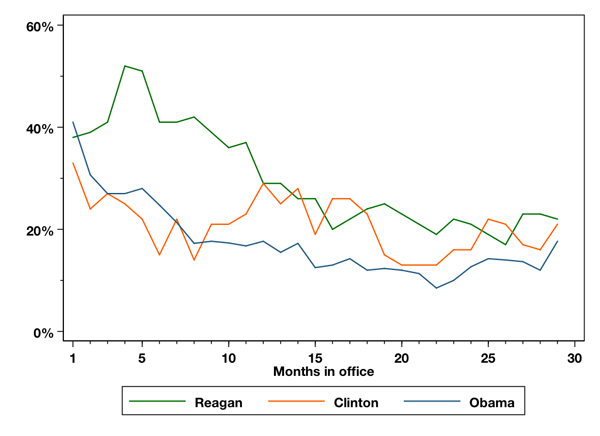 As Figure 1 illustrates, Obama has quickly become unpopular among members of the public who identify as Republicans, following a similar trajectory to Ronald Reagan and Bill Clinton (who both suffered significant first-term scandals). By contrast, the September 11 attacks provided George W. Bush (who is omitted from Figure 1) with a massive approval boost that helped protect him from scandal for more than two years afterward. However, Obama’s vulnerability has been mitigated by the number and magnitude of competing news stories. Just as slow news periods seem to encourage scandal coverage, my research shows that pressure from competing stories diverts attention and media resources that could have been devoted to negative coverage of the administration, reducing both the likelihood of presidential scandal and the volume of coverage those scandals receive. In Obama’s case, it is clear that external events have consumed much of the news agenda over the last eighteen months, including the Deepwater Horizon oil spill, the Arab Spring revolts, the shooting of Rep. Gabrielle Giffords, the earthquake and tsunami in Japan and the killing of Osama bin Laden. The saturation coverage that these stories received left little room for scandal, particularly given the volume of debate over the merits of the president’s legislative agenda and his confrontation with the new Republican majority in the House. Other, less quantifiable factors seem to have also played an important role. As the first black president, Obama may be treated less harshly by the press than some of his predecessors. In addition, the birther movement diverted a great deal of conservative time and energy into the false claim that Obama was not eligible to hold office, generating a controversy that received a great deal of media attention but which never made the transition into a full-blown scandal. Going forward, though, the odds of scandal are high and rising. Obama already faces low approval among GOP identifiers and a similarly hostile climate in Congress. Back in March, New York Times columnist Paul Krugman noted that Republicans hadn’t yet made a serious effort to back up claims that the Obama White House is “one of the most corrupt administrations.” As more time passes, pressure to find evidence of misconduct is likely to build — my data suggest that the risk of scandal increases dramatically as the period without a scandal stretches beyond two years. To make this intuition more precise, we can estimate the predicted probability of an Obama administration scandal using the Washington Post scandal onset model described in my article (PDF). 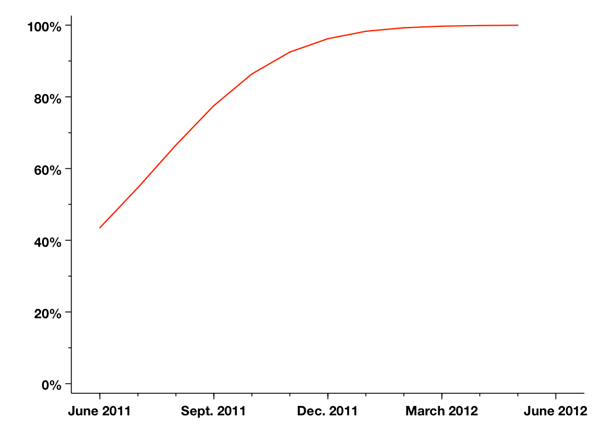 Figure 2 presents the estimated probability of scandal by month over the next year when I hold the covariates fixed at their current values and allow only for the passage of time (assuming no scandal in previous months). This forecast is an extrapolation from 1977-2008 data and should not be interpreted too literally (the sample size of post-Watergate presidents is obviously quite small). However, the results suggest that the likelihood of a presidential or executive branch scandal before the 2012 election are quite high (though continued unrest in the Middle East or other news events could dampen the odds). Given Obama’s reputation for personal integrity, the controversy will likely concern actions taken within the executive branch. Just as the Clinton-era GOP shifted from an early focus on Whitewater to the Travel Office firings, “Filegate,” etc., Republicans in Congress today are shifting away from insinuations about Obama’s birthplace to attacks on his administration’s conduct in office. Recent examples include allegations of an administration “enemies list” as a result of a National Labor Relations Board complaint against Boeing; claims of favoritism in decisions to grant waivers from regulations imposed under health care reform; and allegations that Department of Justice officials allowed straw purchases of guns that were smuggled to Mexico, prompting a standoff with Congress that House Committee on Oversight and Government Reform Chairman Rep. Darrell Issa (R-CA) recently compared to Iran-Contra. Whether these specific allegations will succeed is anybody’s guess — some unexpected new controversy may instead provide the spark — but the first Obama scandal is likely to arrive sooner than most people think. Brendan Nyhan is a Robert Wood Johnson Scholar in Health Policy Research at the University of Michigan until July 2011, when he will join the Department of Government at Dartmouth College as an assistant professor. He blogs at http://www.brendan-nyhan.com.